This update requires you to update BTT to v2.667 to update! Enable 'Update to Alpha Builds' in the BTT Advanced Settings. Visit the Top Post to update! @Dom Escape keys in the CS will be fixed soon. I plan to redo how it updates it’s look. let me first say thanks for your hard work! 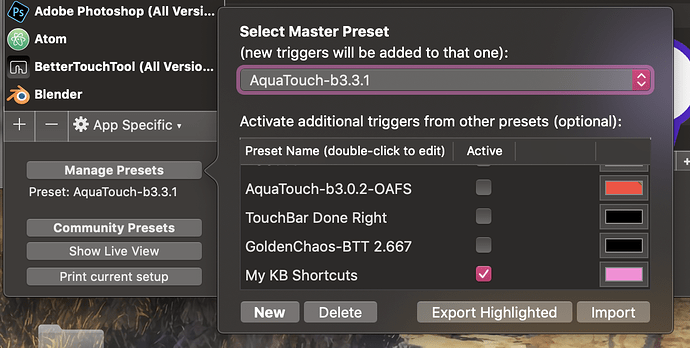 I'm just a few months on BTT and switched 2 weeks ago from GoldenChaos to your 3.2.beta .. took me a few days to get used to but the separate app controls are really nice! ..
just updated to 3.3 and aside better switching between apple nav and BTT nav a lot indeed has improved. Play pause button works with Netflix (safari) in now playing. it says " no supported apps playing currently" though and because I play it in safari i would expect a safari > button next to the safari toolbar. I'm glad you like the preset! thanks for your kind words. - This is more an aesthetic function rather than a purely functional one. The button allows you to identify the set as an extension set. Without it, it would look like it a full set. 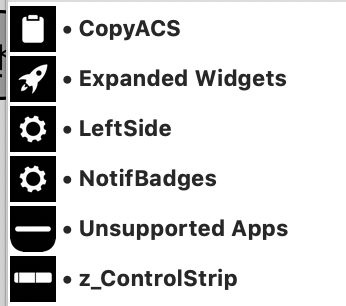 It's also there to make it look like its sliding out under the macOS control strip and overlaying the other controls, suggesting it is meant to only be opened temporarily, much like apple's native now playing set and call controls. It's interesting that it's happening on your mail app. I haven't made support for any mail app so I'm wondering why this is. 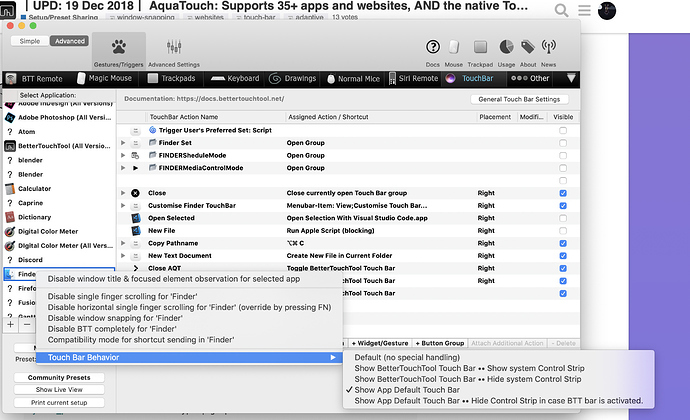 Can I ask what mail app you use and also a screenshot of this behaviour in your mail app? - lol, you probably understand that those are my tasks from my calendar and reminders. I'm not sure if you're just joking here or having a problem with these widgets though. If they're not showing up be sure to install iCalBuddy (link in the setup window). What did you mean by the safari > button? I don't quite understand that one. Thanks for your reply! Glad you enjoyed it! X Button: I probably edited the mail part under the wrong option, I was talking about the double escape button..
with the blue button to return to the safari settings..
Ah yeh, the escape key widgets were probably just still thinking and sorting themselves out. Give them some time and they'll probably sort themselves out. ahahahaa thats funny. I changed their code to display that for the hero image photoshoot and forgot to change them back. Fixing it right away! ah, lol. Well now you know its there (i guess). It's mostly there to keep your context rather than a directly functional trigger. A Netflix safari widget isn't supported yet and it'll be hard for me to make one for it since I don't have an account and it isn't a free service.. I don't really know how it all works so i'd be designing blind unless I get access somehow! Download the update at the top post! When using AQT, some of my keyboard shortcuts stop registering. I have ⌘J bound to ⌥⌘← in Google Chrome (which is the Previous Tab) command. Similar bindings for forward tab and similar bindings in Safari all stop working as soon as AQT is loaded. I don't see the same issue with GoldenChaos for example. Notably some of my global key bindings do work. I am on BTT v2.667 and AQT b3.3.1. huu this is weird. I don't think this is an error on my side... It doesn't seem to be doing this to me, could you check if this is set for the problem sets? If so, maybe it's an issue with the new BTT feature. @everyone having the same issue? @Andreas_Hegenberg? I'll check the behaviour for Photoshop. system_profiler SPBluetoothDataType | grep -i "Power: On"
I'd appreciate your help with animate! Give me a bit of time though, I'm still kind of too busy to implement new sets as of now. I'd probably Private Message you if I get up to it, if that's fine with you. I'm assuming your custom BTT keyboard shortcuts are not working anymore. Are they appearing in BTT? There has been a fix regarding keyboard shortcuts and activation groups in the latest alpha, maybe that solves the issue? Maybe. AQT uses conditional activation groups ALOT. @bennyty, try updating BTT to 2.668? @yuuiko thank you so much for your help! but it seems that changing to the last one now works great! 4 Maybe I found what caused Photoshop problem ... Look here! 5 Yassss now BT toggle works perfectly!! Of course! PM me when you want! I didn't set those apps to those settings. @Andreas_Hegenberg, I've noticed that this has been happening frequently, even on BTT stable. 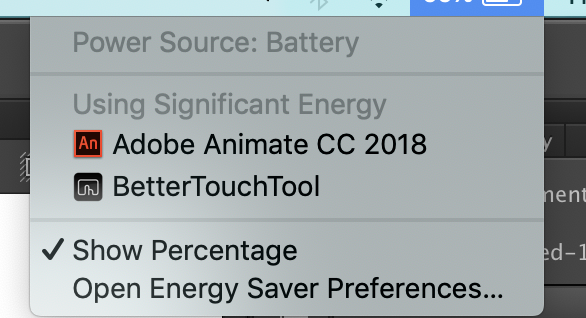 The Touch Bar Behaviour seems to shuffle around a bit on import. It's very hard to catch especially because of the large amount of groups AQT has, and also how the setting only changes it subtly so it's hard to realise, but it's defenitley happening. On my side, I've had to fix that specific setting on multiple occasions. It just seems to flick random settings to different ones, and only after importing a new preset. Could you take a look? I'd like to know what it was showing to figure out what's causing it. Thanks again for your feedback! AQT has come a long way because of your feedback! About power drain I was starting to think it was caused by BTT alpha, but no! Because using your old AT 3.0 I've no problem at all. During the day I use a lot play/pause button widget for spotify, long press on play button on the right to stop play/pause music, calendar widget on the right, emoji button and youtube widget. That's all! Thanks a lot for for your help @yuuiko!! the new features in the alpha version are not yet optimized completely, performance will improve with the final release soon! As @Andreas_Hegenberg said, this AQT version uses the alpha BTT which has more features but also more bugs. I'll look into the issues but they may be BTT issues. I don't think I changed the workings of widgets that much, so if they didn't have an issue before then it might not be them. A warning was placed with the download at the top.